In order to improve the safety factor, the most direct and simple way is to increase the fixed weight in the stable part. 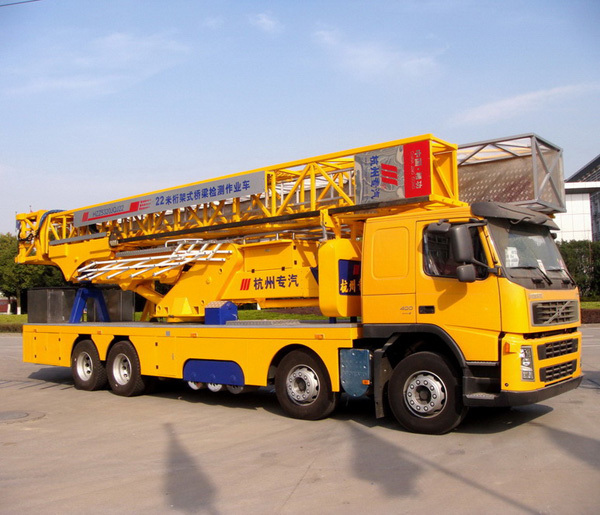 However, with the increase of the technical parameters of the bridge detection vehicle and the limitation of the quality parameters, the simple increase of the fixed weight can not meet the safety factor. When the safety factor is reduced, it is possible to cause the vehicle overturning accident, so it is better to take some measures to improve the operation safety of the bridge detection vehicle in addition to increasing the fixed counterweight. The application of anti rollover control system improves the safety of bridge inspection vehicle. For the safety problem of bridge detection vehicle caused by the inclination angle of the cross slope, an anti-tipping device has been developed. Unlike the leveling system of the frame platform, this device mainly reduces the tilting torque by controlling the length of the tilting arm relative to the fulcrum. The anti-rollover device mainly includes the controller installed at the rear end of the vehicle, the inclination sensor on the platform of the frame, the electromagnetic directional valve installed in a rotary assembly, four-bar linkage mechanism, adjustable distance cylinder and so on. The four-bar linkage mechanism consists of two parallel connecting rods, and the adjustable distance cylinder and the connecting rod are inclined at a certain angle. The working principle is that when the truss bridge detection vehicle detects the bridge deck with dip angle a, the dip angle sensor detects the dip angle a of the bridge deck and transmits the information of the dip angle a to the controller through the line. After processing, the controller converts the dip angle signal to the control signal and transmits it to the electromagnetic reversal valve. The valve makes the corresponding action, through the hose to adjust the distance cylinder cylinder cavity into the oil, adjust the distance cylinder piston out. Under the action of the piston extension, the truss structure of the tilting part moves upward together, and the two connecting rods incline at the same time, which shortens the distance between the truss structure and the fulcrum, and the corresponding tilting arm reduces the tilting torque accordingly, thus reducing the truss bridge detection vehicle on the deck with tilting angle. The risk of rollover is detected during operation.